My friends came over to my house to play sew today and we all fit in my newly outfitted sewing space. Except the ironing board - it took up too much space, so it was set up in the kitchen. I didn't plan much sewing for today as I took most of Monday to clean and organize and sort so I would have some idea of what to pack for my fall quilt retreat on the weekend. 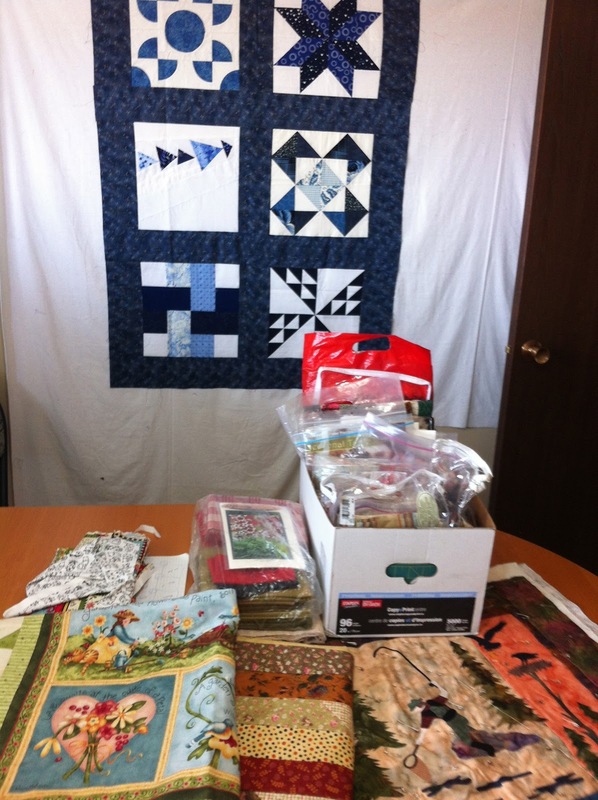 Our Dalemead Quilters Guild is doing a PIGS (Projects In Grocery Sacks) challenge for the second year. 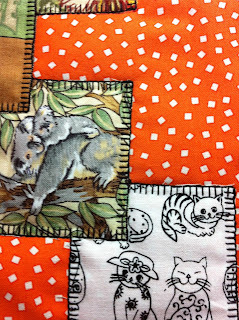 A PIGS project is basically any project that is not finished, it could be as little done as a pile of fabrics with a pattern, to a quilt that's waiting for a binding. Last year I counted 16 of these partially completed projects, this year the total so far is 21. Two were off to be quilted when I took this picture, but one of those is back and waiting for me to add the binding. Some of these have been here for a long time - like that fisherman on the bottom right - he's been waiting for my machine quilting skills to improve enough for some creative threadwork on the quilting. And, although I haven't been as active on the online swaps this year, the mini quilt challenge on Flickr for this round was all about initials. 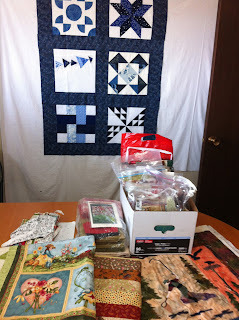 My swap partner was Karen from Norway and to make a quilt featuring the letter K was a challenge. My first step was to go online and search for K words that I might be able to find on fabric. Not finding much, I then went searching through Norwegian words and found a few there. 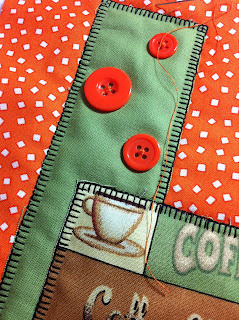 I can't show you the finished quilt until I get it in the mail and Karen gets it at her end, but I've given you a sneak peek here! I'm so jealous that you had friends over to sew! Someday, hopefully soon, that will happen for me too. What I can see of your quilt looks great! Swaps are so much fun. Those look like some great blocks! I've got a lot of PIGS around. A retreat sounds like so much fun! Thanks so much for stopping by my blog and commenting - this is the only way I could find to contact you. There's no email attached to your Blogger profile. You may want it that way but in case you don't, I thought I'd let you know....Anyway in answer to your question, the Craftsy classes have been great so far. Once you buy the class, it's available to you forever to watch as many times as you'd like. I am afraid to count up my PIGS. 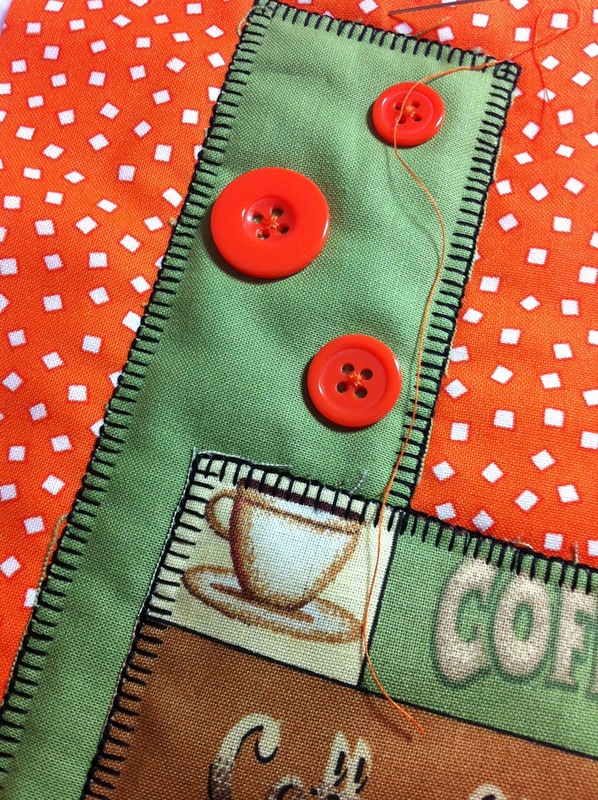 Your blocks look very cute with the blanket stitching. great looking projects!! Thanks for visiting..the Wicked hop is going to be fantastic!! Some interesting projects and the PIG sounds like a great way to get things done. 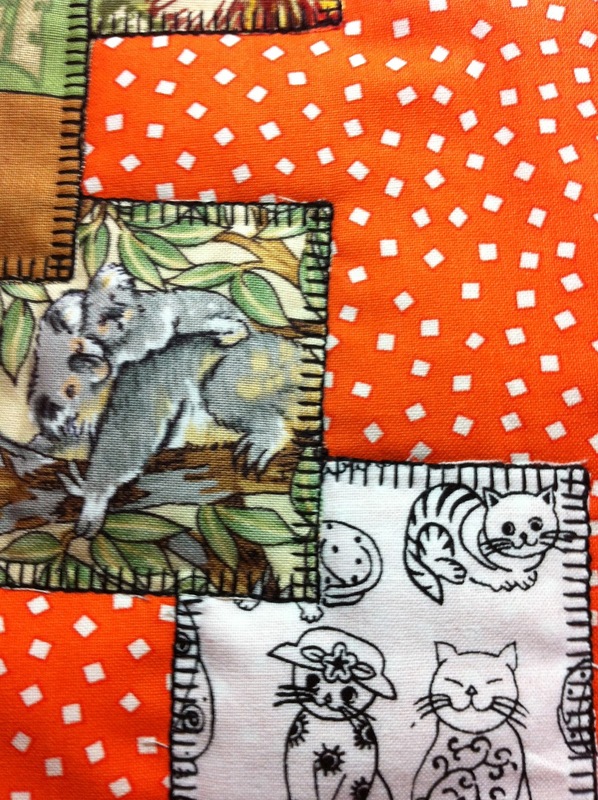 You have lovely pigs, and isn't it nice to have friends to share our fabric addiction with?! I've never heard of a PIGS challenge. What a great idea!